The federal agency in charge of saving salmon has hired two consensus-building groups to ask Northwest leaders what long-term steps should be taken to overcome persistent conflicts over restoring dwindling salmon and steelhead runs. The move was welcomed Thursday by U.S. Sen. Ron Wyden in a statement to The Daily Astorian. NOAA Fisheries Service has hired the Oregon Consensus program at Portland State University and the William D. Ruckelshaus Center in Washington state to interview 150 people. Their initial report is due this summer. Barry Thom, deputy regional administrator for the agency, said they are looking for a regional picture of what people think it will take to bring about recovery for the fish. States, Indian tribes, conservation groups, fishermen and farmers have long had different views on how to regulate fishing, dam operations, hatcheries and irrigation withdrawals. Sen. Wyden has pressed for all groups to work together for some time. "As I said earlier this year, I have great faith in collaborative discussions and I support stakeholders meeting to talk about an issue that is so vitally important to the Pacific Northwest - the recovery of the salmon," he said in a statement to the newspaper. "I commend NOAA for taking steps to engage all the interested parties in looking at the long-term recovery of the salmon." The interviewers will be neutral, NOAA said, and responses will not be attributed to specific people to promote candid conversations. The effort, outlined in a NOAA letter to 150 groups this week, will cost more than $200,000, with roughly 50 additional slots set aside for interviews of people mentioned in initial conversations. NOAA wants a basinwide plan that integrates the local recovery plans developed in the Columbia and Snake River basins, Thom said. A bigger challenge is reaching consensus on the right mix of fishing restrictions, hatchery reforms, dam modifications and habitat restoration to bump 13 runs of salmon and steelhead off the endangered species list. 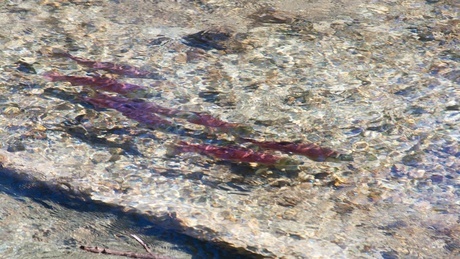 Gilly Lyons, policy director for Save our Wild Salmon, said, "Maybe it will get a more constructive conversation going."